葛宪民, 杨文敏, 朱秋映, 吴秀玲, 沈智勇, 朱金辉, 蓝光华, 陈欢欢, 孟琴, 周信娟, 丁冬妮, 刘玄华, 唐帅, 黄精华, 邓月琴. Ge Xianmin, Yang Wenmin, Zhu Qiuying, Wu Xiuling, Shen Zhiyong, Zhu Jinhui, Lan Guanghua, Chen Huanhuan, Meng Qin, Zhou Xinjuan, Ding Dongni, Liu Xuanhua, Tang Shuai, Huang Jinghua, Deng Yueqin. Ge Xianmin, Yang Wenmin, Zhu Qiuying, Wu Xiuling, Shen Zhiyong, Zhu Jinhui, Lan Guanghua, Chen Huanhuan, Meng Qin, Zhou Xinjuan, Ding Dongni, Liu Xuanhua, Tang Shuai, Huang Jinghua, Deng Yueqin. Epidemiological characteristics of HIV/AIDS in Guangxi Zhuang Autonomous Region, 2010-2017[J]. Chinese Journal of Epidemiology, 2019, 40(3): 315-321. Abstract: Objective To understand the characteristics of HIV/AIDS epidemic in Guangxi Zhuang Autonomous Region (Guangxi) with a purpose to accurately provide scientific basis for prevention and control measures, 2010-2017. Methods Data were retrieved from case reporting cards of Guangxi during 2010 to 2017 through National HIV/AIDS Comprehensive Response Information Management System. Data was analyzed using epidemiological methods such number of cases, proportion and rate. χ2 test was used for statistical analysis. Results The HIV positive rate was 12.53 per ten thousand (85 182/67 959 000) in Guangxi during 2010 to 2017. The number of newly diagnosed HIV/AIDS cases and the number of death yearly respectively increased by 22.34%(2 602/11 648) and 32.83% (952/2 900) in 2011 compared with 2010, and both showed a six-year continuous downward trend (the number of newly diagnosed cases respectively 12 229 cases, 10 877 cases, 9 460 cases, 9 190 cases, 8 848 cases, 8 680 cases, and the number of death respectively 3 888 cases, 3 316 cases, 2 914 cases, 2 717 cases, 2 595 cases, 2 600 cases) from 2012 to 2017. But proportion of late discovery remained above 50.00% (50.53%-57.06%) for eight-years continuously. The ratio of male and female was 2.47:1 (60 639/24 543). The ratio of males and females aged 50 and over was 2.71:1 (28 654/10 557). Proportion of the cases in 25-49 years old group and 50 years old group accounting for 47.40%(40 377/85 182) and 46.03% (39 211/85 182) respectively. The occupation was farmers accounting for 68.40% (58 262/85 182), housekeeping, housework and unemployment accounting for 11.21% (9 546/85 182), student accounting for 0.86% (729/85 182). Heterosexual transmission accounted for 90.60% (77 171/85 182, homosexual transmission accounted for 3.13% (2 669/85 182), injection drug use transmission accounted for 4.60%(3 924/85 182) and mother-to-child transmission accounted for 0.73% (619/85 182). Conclusions The number of newly diagnosed cases and the number of death yearly showed a continuous downtrend for six-years from 2012 to 2017. However, proportion of late discovery remained above 50.00% for eight-years. The major route of infection was heterosexual transmission. With the change of HIV/AIDS newly epidemic mode in Guangxi, there are many new challenges for HIV/AIDS prevention and control work. Strategy of targeted intervention modes should be innovated for a new breakthrough. UNAIDS. Global HIV/AIDS statistics-2018 fact sheet: 2017 global HIV statistics[EB/OL]. (2018-11-22)[2018-12-01].http://www.unaids.org/en/resources/fact-sheet. National Center for AIDS/STD Control and Prevention, Chinese Center for Disease Control and Prevention. National HIV/syphilis/HCV sentinel surveillance report in 2017[R]. Beijing: 2017. 中国疾病预防控制中心性病艾滋病预防控制中心, 性病控制中心. 2017年12月全国艾滋病性病疫情[J]. 中国艾滋病性病, 2018, 24(2): 111. 唐振柱, 葛宪民, 沈智勇. 广西艾滋病防治与研究进展报告(2010-2015)[M]. 南宁: 广西人民出版社, 2016. Tang ZZ, Ge XM, Shen ZY. Guangxi AIDS prevention and treatment progress report, 2010-2015[M]. Nanning: Guangxi People's Publishing House, 2016. 葛宪民, 唐振柱, 朱秋映, 等. 广西2010-2015年艾滋病流行特征及趋势分析[J]. 中国艾滋病性病, 2017, 23(1): 40-43. 葛宪民, 唐振柱, 李国坚, 等. 广西艾滋病防治警示性宣传教育模式探讨与应用[J]. 中国艾滋病性病, 2017, 23(11): 1057-1061. 许娟, 毛宇嵘. 中国艾滋病综合防治数据信息管理系统现况与展望[J]. 中国艾滋病性病, 2016, 22(9): 756-758. 金霞, 熊燃, 王丽艳, 等. 2010-2014年我国HIV感染病例的晚发现情况分析[J]. 中华流行病学杂志, 2016, 37(2): 218-221. 汤后林, 毛宇嵘. HIV感染者检测晚的原因、影响及其对策的研究进展[J]. 中华预防医学杂志, 2010, 44(11): 1049-1051. 李小花, 齐建国. 我国农民健康状况、健康知识态度与行为现状调查[J]. 现代预防医学, 2015, 42(3): 479-484. Li XH, Qi JG. The survey on the knowledge, attitude, practices of health among the peasants in China[J]. Mod Prev Med, 2015, 42(3): 479-484. 郝阳, 崔岩, 孙新华, 等. "四免一关怀"政策实施十年来中国艾滋病疫情变化及特征分析[J]. 中华疾病控制杂志, 2014, 18(5): 369-374. Hao Y, Cui Y, Sun XH, et al. A retrospective study of HIV/AIDS situation:a ten-year implementation of "four frees and one care" policy in China[J]. Chin J Dis Control Prev, 2014, 18(5): 369-374. 吴尊友. 我国艾滋病经性传播新特征与防治面临的挑战[J]. 中华流行病学杂志, 2018, 39(6): 707-709. 孟琴, 沈智勇, 周信娟, 等. 2010-2014年广西青年学生艾滋病流行特征[J]. 中国艾滋病性病, 2016, 22(6): 458-459, 467. 马静, 佟雪, 惠珊, 等. 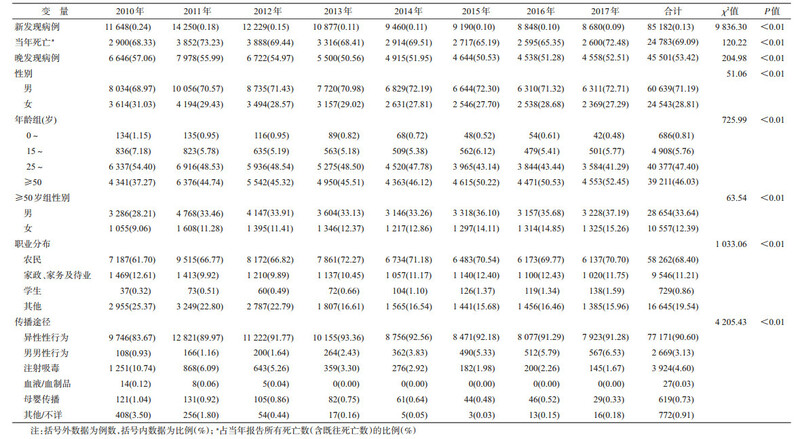 黑龙江省2012-2017年艾滋病疫情分析[J]. 哈尔滨医药, 2018, 38(3): 222-224. Ma J, Tong X, Hui S, et al. Analysis on HIV/AIDS epidemic situation in Heilongjiang province from 2012 to 2017[J]. Harbin Med J, 2018, 38(3): 222-224. 林海江, 陈文, 许圆圆, 等. 中国东部沿海地区艾滋病疫情发现策略研究[J]. 中华疾病控制杂志, 2015, 19(6): 578-581.